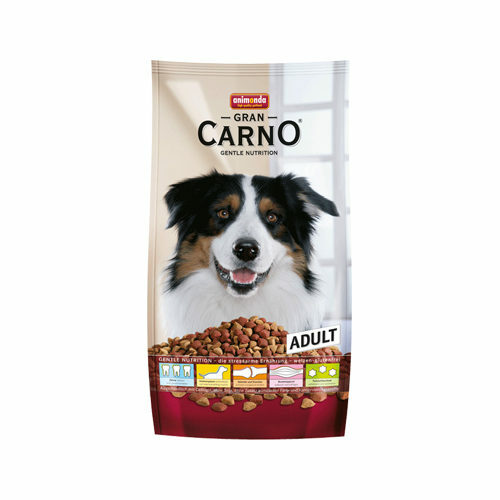 Animonda GranCarno Gentle Nutrition Adult is healthy dry food for your adult dog. The food supports the immune system, strong bones and the reduction of tartar build up. Animonda GranCarno Gentle Nutrition Adult is balanced, healthy and tasty dry food for your adult four-legged friend. The top quality ingredients of this food have been carefully selected. Gentle Nutrition supports your dog's immune system, joints and bones. It also contains Vitamin C which helps to reduce dental plaque and the formation of tartar. Poultry meat flour, corn, rice, beet pulp, poultry fat, beef fat, poultry liver, corn gluten, fish oil, yeast, spinach (dried), chicory pulp, whole egg, sodium chloride, grape seed extracts (0.25%), mussel extracts (0.1%) and yucca. Have you used Animonda GranCarno Gentle Nutrition Adult before? Let us know what you think about this product.